How can teachers ensure a pedagogy of possibility underpinned by social justice, and what has literacy got to do with this? 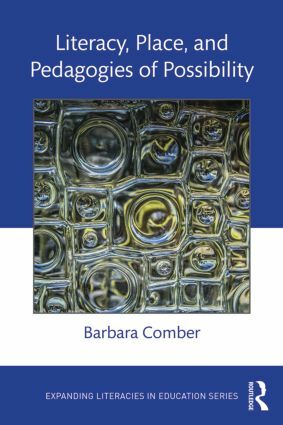 This book explores the positive synergies between critical literacy and place-conscious pedagogy. Through rich classroom research it introduces and demonstrates how a synthesis of insights from theories of space and place and literacy studies can underpin the design and enactment of culturally inclusive curriculum for diverse student communities, and illustrates how making place and space the objects of study provide productive resources for teachers to design enabling pedagogical practices that extend students’ literate repertoires. The argument is that systematic study of and engagement with specific elements of place can enable students’ academic learning and literacy. This novel combination of multidisciplinary theory and classroom research extends previous work in critical literacy pedagogy, drawing on two decades of ethnographic and collaborative inquiry in classrooms situated in culturally and linguistically diverse classrooms. Chapter 5: Reimagining school literacy: What if…? Barbara Comber is Research Professor, Faculty of Education, Queensland University of Technology, Australia. The Expanding Literacies in Education Series features books that highlight the changing landscape and explore new directions and theoretical tools in literacy studies as it is transforming education—including material, embodied, affective, and global emphases; digital and virtual worlds; and transcultural and cosmopolitan spaces. Some books in the series locate emerging literacies in practices that extend or trouble their historical uses and functions. Others cross disciplinary borders, bringing new epistemologies to bear on evolving practices that question the very foundations of literacy scholarship. Polemical and forward-looking, encompassing public and vernacular pedagogies as well as formal education, these books engage researchers, graduate students, and teacher educators with new and emerging theoretical approaches to literacy practices in all of their complexities, challenges, and possibilities.